The audio degradation in this session was caused by a microphone fault. Kalyan and Vance took time afterwards to troubleshoot and Kalyan got his audio back fine using the onboard mic, so we’re sorry for the audio issues, but it was something simple, and we’ll get Kalyan back to repeat his session. Thanks though to everyone in the Elluminate session who was so patient and supportive. 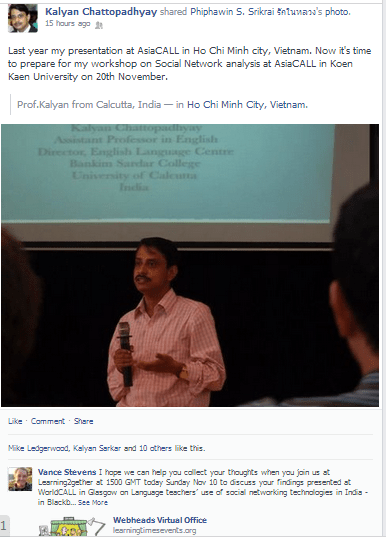 Teachers and teacher educators in India are increasingly using social networking technologies in a variety of ways with friends, relatives, colleagues, and students for a number of purposes starting from sharing information and pictures to developing personal learning network for their own professional development. Though such use of technologies is very limited in formal learning, and pre-service and in-service training, informal and situated use of these technologies in teaching learning practices is very much visible. In this presentation, I’ll begin by discussing what social networking technologies these English language teachers and teacher educators are using, what they are using for, and how they are being used. Here I’ll draw on an exploratory study that I conducted using a survey questionnaire and semi-structured interviews to have a foundational understanding of how the Indian English language teachers are using social networking tools and media (Chattopadhyay, 2010). Then I’ll share their views on the strengths and weaknesses of such practices, and analyse textual trace of their practices in terms of pedagogical stances such as ‘resistance’, ‘replacement’, ‘return’ and ‘remediation’, and ‘recontextualisation’. 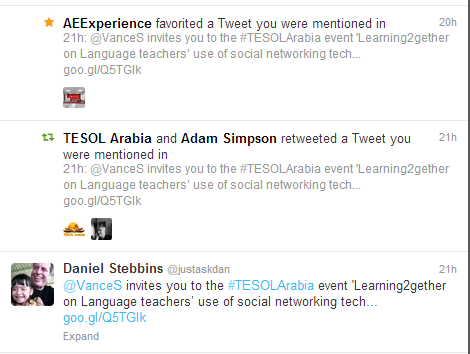 Finally, I’ll consider how these technologies can be made more relevant to teachers’ specific educational context. • How are your syllabus and the training going so far? 26 outstanding E-teacher Scholarship recepients are currently in the United States as part of our E-teacher Exchange Program. On Monday, November 4 and Tuesday, November 5, the E-teachers will be presenting their final projects. The final projects are teacher-training workshops on a variety of topics.If you are interested in watching these presentations online, please feel free to join us! Learn about Bluehost’s SPOKE program, the open platform for education, and the open source tools given to educational institutions that result in visible evidence of learning for students. This webinar will introduce you to Bluehost SPOKE’s open integration with common LMS tools, and the efforts to better the engagement between students and staff members. Dear Colleagues,The U.S. Department of State and UC Berkeley are offering a 5-week writing course College Writing 2.1x: Principles of Written English. This course is an open online course available to both English language learners and teachers interested in academic writing. This course is free and open to any interested participants. The course begins Friday, November 8th and will be 5-weeks long. All coursework is asynchronous (meaning the content can be accessed at anytime during the week and there are no live sessions to attend) and assignments are due at the end of each week. Learn more and register here: https://www.edx.org/course/berkeley/colwri2-1x/college-writing-2-1x-principles/1194. 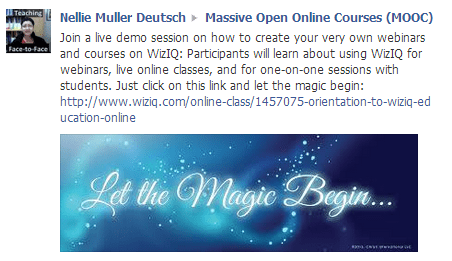 You can also visit the course Facebook Page. Check with your local U.S. Embassies and American Corners as some are hosting supplemental facilitation sessions to collaborate with students and colleagues during this learning process. Or consider forming your own learning group! Peggy George, Lorie Moffat and Tammy Moore will be hosting another Classroom 2.0 LIVE show. As an extension to the Classroom 2.0 Ning community, Classroom 2.0 “LIVE” shows are opportunities to gather with other educators in real-time events, complete with audio, chat and desktop sharing. A Google calendar of upcoming shows is available athttp://live.classroom20.com/calendar.html. Shelly Terrell topic was YouTube Video Editing Tools. Shelly will be sharing ideas for teaching with YouTube and ways to use the YouTube video editing tools to personalize video creation by students and teachers. She is always inspiring with an endless number of practical examples and stories for using the tools she shares (almost always free tools). Shelly is an education thought-provoker, The 30 Goals Challenge author, International Speaker, #EdChat founder, Host for American TESOL Free Fri Webinars and organizer for the annual Reform Symposium (free, virtual education conference). More information and details are at http://live.classroom20.com. If you’re new to the Classroom 2.0 LIVE! show you might want to spend a few minutes viewing the screencast on the homepage to learn how we use Blackboard Collaborate, and navigate the site. Each show begins at 12pm Eastern (GMT-5) and may be accessed in Blackboard Collaborate directly using the following Classroom 2.0 LIVE link at http://tinyurl.com/cr20live. On the Classroom 2.0 LIVE! site (http://live.classroom20.com) you’ll find the recordings from our recent ”Learning with EduPuppets in K-12” session with Sam Patterson. Click on the Archives and Resources tab.